By mid June we had our ducks in a row. Dan and I had already agreed that our groundcover selection to replace the lawn had to be evergreen to provide year-round interest. Going with 28 flats of Hedera helix ‘Baltica’ (English Ivy), the groundcover was ordered. We already had proof of how tough it is and how little water it needs once established because it’s thriving on a slope in sun/part shade in our own backyard already and at a client’s house. It only took one growing season to fill in there and it’s the same conditions in the front yard. My theory is if a planting area or bed is prepared well, that’s half the challenge for the reward of a successful planting. So we called in Jeffreys Creek, one of my landscape crews, to get us off to a good start and do the heavy, up front work for us. 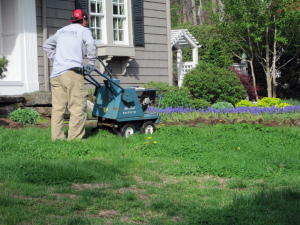 8 am Landscape crew arrives with a sod cutter to remove the lawn, install metal edging (to contain the Ivy groundcover from the existing perennial and shrub beds) and spread and till in organic compost. We thought this was the perfect opportunity to extend the Flatstone Walkway from the front entrance to the left side path, to be able to walk completely around the house on hardscape material – the above right photo shows the 4 foot wide space allowed for the path to be added later. 1 pm Planting area is finished being prepared and is ready for planting. 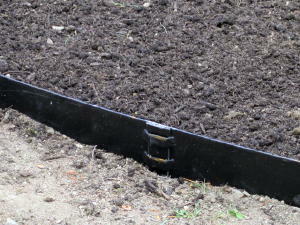 Plant flats are delivered from the nursery, but ground conditions are too wet for planting following 2 days of rain. In the gravel driveway “holding area“, I kept the flats watered daily until the next weekend. Dan and I planted 18 of 28 flats the first day. 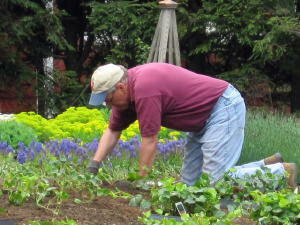 As we planted, I watered in small sections at a time. Aside from watching our own progress, the best part was talking with curious neighbors that passed by (in cars and on foot) and explaining our vision for the yard. Our neighbor across the street is still scratching his head (he loves mowing his lawn). I think he fears he’ll never get to see Dan again if he doesn’t have the lawn to mow once a week. We really had a system going by now. He would dig and I would plant, then we would switch so our backs would hold up longer. We planted the last 10 flats in record time as we chanted, “No more mowing”. 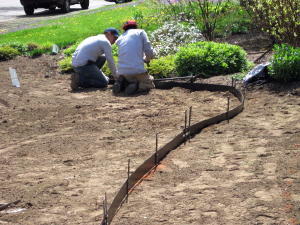 Our lawn already has an irrigation system, so it only needed to be modified by adding drip hoses in rows every 2 feet between the new groundcover plants. 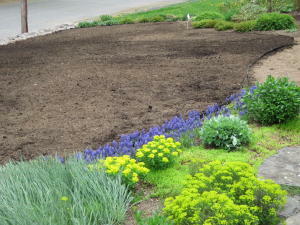 This was added as a new zone to be controlled separately from the other plant beds of shrubs & perennials. To establish the new plants, we set the timer for 1 hour in the early morning, 3 days per week – hoping that Mother Nature would help us out on the watering and not have to actually use the irrigation so much. We lucked out – what followed was several more weeks with consist rainfall that really helped the plants take hold. Without a workable weekend in site, I had to go it alone for 4 hours on a weekday to spread the bagged Coco Mulch. Now this was back breaking work, getting in between each Ivy strand, keeping a consistent depth and spreading it evenly. 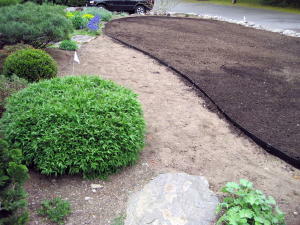 I used a small hand rake to spread it and keep from pulling out the delicate plants. Although Coco Mulch is organic, gardeners should use caution using it around dogs and cats – see http://www.aspca.org/pet-care/ask-the-expert/ask-the-expert-poison-control/cocoa-bean-shell-mulch.aspx. Well, it was a labor of love, now the hard part is done. With a weekly liquid fertilizing through July and 15 minutes of weeding per week, the ivy groundcover should be well established by fall and filled in completely by next summer. Our weekends are now filled with other events (and projects), but outside our own yard the “mow & blow” landscape crews and neighbors continue cutting, edging and blowing 7 day a week starting at 7 a.m. Will it ever end? It has for us. 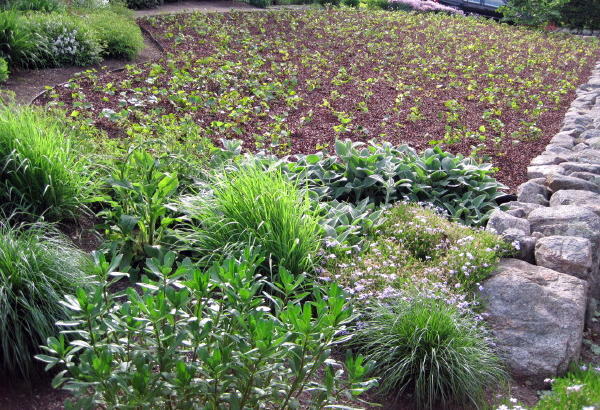 Stay tuned for Alternative to a Lawn, Step 3 – All grown up! 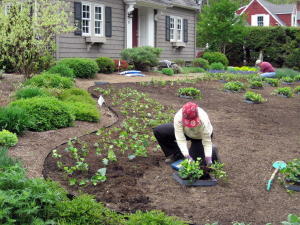 This entry was posted in Groundcovers, Lawn Alternatives, planting and tagged Groundcovers, Lawn Alternatives, Planting. Bookmark the permalink. Love this post. I’m going to follow step-by-step next year, so I can also walk the talk. Thanks Denise! Terrific – another convert! After the hard work, you’ll love the results and the free time. What an inspiration! Please include future pictures as the ivy grows. I am so tired of the “mow and blow” crews that descend on all our neighborhoods. This just seems like a great solution to lots of issues. Thanks. Seeing is believing – thanks for your feedback, Katie. Looking forward to having you in the neighborhood and we’ll talk once you have settled in.